This great Security Light not only Records 20 second Video & Speech evidence onto an SD Card but it also has the option to replay your own Pre-Recorded Message, Dog Bark or Siren to the visitor or intruder, fully adjustable allowing you to set the system to suit your own specification. Powered by 240v AC using a 300 watt Halogen Bulb, the Flood Light and Camera can be manually rotated to suit many different locations. The system is supplied with a 2GB SD card which the images are stored on and the oldest are automatically delected and overwritten when the card reaches full capacity to ensure records of recent events are always available and time & date stamped. 1 x Light with Camera. 1 x 300 watt Halogen Bulb. 1 x 2GB SD Card. Size: 280 (D) x 180 (W) x 220 (H) mm. Power Supply: 240v AC & 4 x AA Batteries (for easy setting up, not supplied). Activation Method: Built in PIR (passive infrared detector). PIR Detection Angle: 150 degrees. PIR Detection Distance: 12 metres. Bulb: Max 300 W Halogen Bulb. 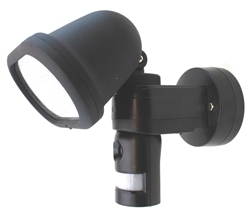 Swivel Light: Yes (manual side to side & up & down). Swivel Camera: Yes (manual side to side & up & down). Operating Temperature: -10 - + 40 Degrees. Pixel: 640 x 480 Pixel VGA. Video Recording: 20 second recording. Time & Date Stamped: Yes. Maximum SD Card: 32 GB. You will record approximately 100 videos onto the 2GB SD Card supplied (with the option of fitting larger cards up to 32 GB).